Chronic renal failure, sometimes referred to as kidney disease, is one of the most common conditions affecting older cats. In most cases, chronic renal failure is progressive over time so that there is a gradual advancement and worsening of the disease. The rate of progression of the disease varies considerably between individuals. Appropriate support and treatment can both increase the quality of life of affected cats and prolong life by slowing down the progression of the disease. What causes chronic renal failure? Polycystic kidney disease (an inherited condition seen mainly in Persian and Exotic cats where normal kidney tissue is gradually replaced by multiple fluid filled cysts that develop within the kidneys). Kidney tumours – for example lymphoma (a solid tumour of white blood cells) can affect the kidneys and cause renal failure. Infections – bacterial infection of the kidneys (‘pyelonephritis’) may occur as an extension of bladder infections and can lead to sufficient damage of the kidneys to cause renal failure. Other causes – e.g., damage to the kidneys by toxins, defects in the development of the kidneys at birth, persistent inflammation such as glomerulonephritis. In most cases a specific cause cannot be found for renal failure, and treatment is aimed at management of the disease. Where an underlying cause can be diagnosed, and if this is treatable, there may be the potential to halt progression of the disease. How common is chronic renal failure? Chronic renal failure can occur in cats of any age, but is most commonly seen in middle to old-aged cats, and it becomes increasingly common with age. 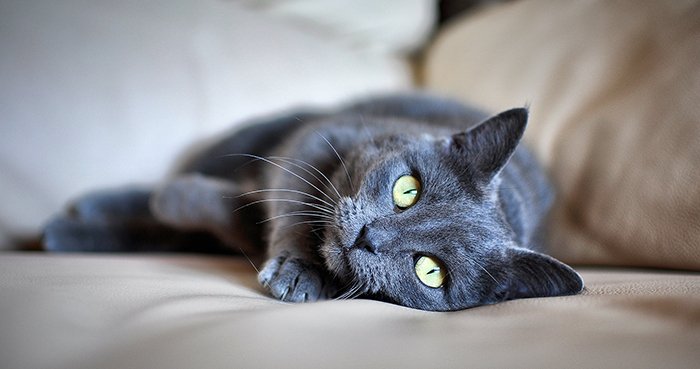 It has been estimated that around one in five cats over 5 years of age has renal failure. In general, chronic renal failure is seen about three times more frequently in cats than it is in dogs. What are the clinical signs and complications of chronic renal failure? In most cases chronic renal failure is a progressive disease with a slow, insidious onset, although occasionally the signs may appear to develop quite suddenly. Many of the clinical signs are quite vague and non-specific – arising at least in part simply from the accumulation of toxins in the blood that would normally be excreted in the urine. The most common signs seen in affected cats are a poor appetite, weight loss, dehydration, lethargy and depression. There is often an increased thirst along with increased volumes of urine being produced (due to an inability to concentrate the urine in many affected cats). Other signs may include a poor coat, vomiting, bad-smelling breath, ulceration in the mouth and weakness. As chronic renal failure is a progressive disease these signs tend to get worse over time. With the diverse functions of the kidneys, a wide variety of complications can arise in affected cats. These include electrolyte abnormalities (e.g., low blood potassium concentrations, high phosphate concentrations), the retention of too much acid by the body (‘acidosis’), the development of high blood pressure (hypertension) and the development of anaemia (low red blood cell count). The clinical signs shown by a cat with chronic renal failure are not specific. They can be caused by other diseases too. Diagnosis of chronic renal failure is therefore made by collection of blood and urine samples for analysis. Two substances in the blood – urea and creatinine – are commonly analysed, as these are products of metabolism that are normally excreted by the kidneys. In renal failure, the blood concentration of these two products will be increased. However, as there are some conditions other than chronic renal failure that can also elevate these concentrations, a urine sample is usually analysed at the same time. With chronic renal failure, typically in addition to appropriate clinical signs and increased urea and creatinine concentrations there will also be poorly concentrated urine. How is renal failure managed? In some cases, a specific cause for the renal failure may be identified (e.g., bacterial infection of the kidneys) and if this is the case, treatment for the cause may be possible. In most cases however, a cause will not be identified and treatment is aimed at managing the renal failure. Some cats may require initial intravenous fluids to correct dehydration (and perhaps electrolyte abnormalities), but once stable, treatment is aimed at supporting renal function and minimising the complications of renal failure. Optimal management of renal failure usually requires repeat investigations at regular intervals (including blood pressure assessment, blood and urine tests) to identify treatable complications as they arise, e.g., anaemia (a reduction in circulating red blood cells), low potassium, high phosphate, urinary infections, and hypertension. Why is diet important in renal failure? Water intake – cats with chronic renal failure are more likely to become dehydrated (due to the reduced ability of the kidneys to conserve water by concentrating urine). Maintaining a good fluid intake is very important, and as cats generally gain much of their water from food, whenever possible, cats with chronic renal failure should be fed tinned (or sachet) foods father than dry foods. Protein content – an ideal diet for a cat with renal failure should have a low protein content – many of the toxic products that accumulate in the blood in renal failure are a result of protein breakdown, and feeding a low protein diet will therefore help to minimise this. However, protein restriction has to be performed with care. Too little protein in the diet can lead to excessive weight loss that would be extremely detrimental to general health. For this reason, it is best to use specially designed commercial diets. Low phosphate content – restricting the phosphate content of the diet appears to be quite beneficial in protecting the kidneys from further damage in cats with chronic renal failure. Commercial diets designed to help manage renal failure are, therefore, both protein and phosphate restricted. Other dietary measures – commercial diets for cats with renal failure are also often modified in other ways – for example, the addition of fibre and the addition of some polyunsaturated fatty acids, which may potentially have some additional benefits in the management of renal failure. What other treatments are available for renal failure? Potassium supplementation – some cats with renal failure develop low blood potassium levels, and this itself can worsen the renal failure. Where this is identified potassium supplementation (tablets, gel or powder added to the diet) is of benefit. High blood pressure – cats with chronic renal failure that develop hypertension are at risk of developing further problems. It is important, therefore, to treat hypertension when it is diagnosed and this is usually straightforward in cats with tablets. Treatment of anaemia – in advanced renal failure, anaemia is quite common. If this is mild it may not be a major concern, but with advanced anaemia this can contribute to signs such as lethargy and weakness. Depending on the cause of the anaemia and its severity a number of treatment options may be available including the use of anabolic steroids, iron supplementation, management of any gastrointestinal ulcers and in some advanced cases supplementation with erythropoietin (the hormone that stimulates red cell production) may be of benefit. Treatment of nausea and vomiting – nausea and vomiting are more common in advanced renal failure and can significantly affect the quality of life and the appetite of the cat. Where this is a problem, various drugs can be used to control these signs. Use of ‘ACE inhibitors’ – e.g., benazepril, are a class of drugs that act predominantly as vasodilators (dilate blood vessels). In humans with renal failure they are commonly used to help manage the disease, as they appear to have beneficial effects on renal function and reduce protein loss through the kidneys (which can be elevated and can be harmful in renal failure). There is some evidence that these drugs may be of some benefit in cats with renal failure too, but it is not certain whether all cats necessarily benefit from their use, and which cats are most likely to benefit. Current knowledge suggests that perhaps cats with elevated protein loss in their urine are most likely to benefit, and in all cats where this type of drug is used it is sensible to monitor blood and urine results as well as clinical signs to help determine what benefit is being derived. Once sufficient damage has been done to the kidneys to cause CRF, the compensatory changes and adaptations that occur to try to maintain normal kidney function usually eventually fail and progressive kidney damage occurs. The disease is usually therefore progressive over time and will eventually lead to the need for euthanasia. However, the rate of progression of renal disease varies considerably between individuals and appropriate support and treatment can both increase the quality of life of affected cats and also potentially slow down the progression of the disease.